Pandith W.D. Amaradeva was not only an exceptional artiste but also a man of an era who was a prominent intellectual, a scholar, a visionary and a humanist, President Maithripala Sirisena yesterday said. President Sirisena was addressing the House participating in the second reading of Amaradeva Aesthetic and Research Centre Bill. President Sirisena said State patronage will be a constant presence to pursue Pandith Amaradeva’s vision. The nation is eternally indebted to Pandit Amaradeva for bringing international fame to Sri Lanka, President Sirisena said. The Amaradeva Aesthetic and Research Centre is set up to preserve the unique music tradition developed by Pandith Amaradeva, blending his extensive understanding in local and Indian music, and handing it over to the future generation, President Sirisena said. The centre is a request by Pandith Amaradewa and a promise given by President Sirisena at former’s funeral ceremony. Laying of the foundation stone for the center took place on August 28, 2017 at the Battaramulla Ape Gama complex under the patronage of President Maithripala Sirisena. The project will cost Rs. 250 MN. President Sirisena said Pandith Amaradeva is an exemplary figure for all the artistes in the country. Finance and Mass Media Minister Mangala Samaraweera yesterday said he does not believe in censorship on art and urged Cultural Affairs Minister to reconsider the bans imposed upon certain radio dramas and writings recently. Minister Samaraweera was participating in the second reading of the Amaradeva Aesthetic and Research Centre Bill yesterday. The Minister said a proper method and policy need to be adopted with regard to censorship of art, otherwise if bans are imposed according to personal whims and fancies, it would ultimately violate the right to expression. “Art is something that should be done freely. We should ensure the artistes’ right for expression.” he said. “Certain anti-government groups are trying to orchestrate a Buddhist wave against the government. These groups trigger such incidents.” he said. Minister Samaraweera was speaking about three radio dramas to be broadcast on Independent Television Network (ITN) Radio. The three radio dramas of Malaka Devapriya, Nihon Sepa Labewa, Tharuwan Saranai, Nirwasthran Paraman Sukhan, were accused by several nationalistic organizations and Omalpe Sobhitha Thera that they insult Buddhism. “We do not want to censor books, programs and dramas. After this incident was reported, I personally asked for scripts and went through them. I did not find anything which insult Buddhism in any way as some people claim. In fact, they reveal the truth in this society. The drama named Tharuwan Saranai speaks about celebrity culture and consequences of it. Nihon Sepa Labewa is all about Sri Lankans’ struggle to go Japan and earn money. None of them insult Buddhism. They speak about real problems in this country. I firmly believe media censorship does not resolve any problem in the country, but would make everything much worse,” Minister Samaraweera said. When Minister Samaraweera was speaking about the radio dramas, JO MP Bandula Gunawardena told his attempt to produce a film about the murder to Richard de Zoysa was barred by the authorities. Minister Samaraweera questioned who barred MP Gunawardena’s attempt. “I will never bar anything as such. While we are at it, why don’t you also produce a movie about the murder of journalist Lasantha Wickrematunge? We can do movies on assaulted journalist Keith Noyahr and Prageeth Ekneligoda as well. We can also make a movie about how a family survived a month by spending only Rs. 2,500,” Minister Samaraweera said. “Why don’t you come with two scripts, one on Richard de Soyza and the other of Lasantha Wickrematunge? Let’s get the approval for both,” he said. Minister Samaraweera said the government has decided to introduce changes to certain shortcomings pointed out by the artistes. “We as a government are always sensitive to artistes’ requests. They said certain difficulties they face because of several taxes and we have taken necessary steps,” the Minister said. Minister Samaraweera said the government has decided to reduce the income tax on artistes and writers whose monthly income is over Rs. 50,000. He said the former government imposed a 10 per cent income tax on artistes and writers if their monthly income exceeded Rs. 50,000. Imposing excise duty on liquor based on alcohol volume has decreased its sale 11 per cent during the last six months, Finance Minister Mangala Samaraweera yesterday said. The Minister was participating in the second reading of the Excise (Amendment) Bill in Parliament. Minister Samaraweera said the excise duty on liquor based on alcohol volume will also lessen the health cost that people who consume liquor with a high volume of alcohol incur to the government. Minister Samaraweera said the amendments include a decision to paste a sticker on every bottle of legally produced arrack. He said it will decrease the illegal liquor in the market and will increase the government excise duty revenue. The government will receive an additional revenue of nearly Rs. 20-25 BN if a sticker is pasted on every legally produced bottle of arrack as per the decision. Tamil speaking persons are strongly encouraged to join with Sri Lanka Police as there is a shortage of Police officers fluent in Tamil Language, Law and Order Minister Ranjith Madduma Bandara said. The Minister was responding to a question by UPFA MP Douglas Devananda under the Standing Order 27 (2) in Parliament yesterday. The Minister said that only 15 per cent of the police personnel in the Northern and Eastern Provinces are fluent in Tamil language. He said his ministry together with the National Integration, Reconciliation and Official Languages Ministry is conducting programmes to improve proficiency in Tamil language for Police personnel. MP Devananda questioned the actions by the government to control violent and anti-social acts in the Jaffna District. He said the people in the North are living in fear as sword attacks, arson attacks, and attacks on shops and personal property are increasing. He queried whether drug traffickers or political hands were behind those violent incidents in Jaffna. The Minister said there was no information to claim that drug traffickers or political figures were behind those incidents. He said 38 persons of the Aava group were arrested in the past two to three months for violent acts. He said that additional Police cadres were deployed in areas where such violent acts were reported and special mobile units were deployed for surveillance. The Amaradeva Aesthetic and Research Centre Bill was brought in under the directions of President Maithripala Sirisena, Finance and Media Deputy Minister Lasantha Alagiyawanne said. Participating in the reading of the bill, Alagiyawanne said that it is for the first time that such a Bill was presented to Parliament. He said the Amaradeva Aesthetic and Research Centre will be opened next January. Set up of the centre is a great service to arts and culture in the country, he said. Law and Order Minister Ranjith Madduma Bandara yesterday told the Janatha Vimukthi Peramuna to provide fresh documents requesting to investigate the deaths of two JVP political supports during 2009-2010. The Minister was responding to a query by JVP leader Anura Kumara Dissanayake, who demanded to know why there was a delay in investigations into the killings of two JVP cadres, Chandradasa Naiduwawadu and Nandana Balage. The Minister said he will look into the possibility of investigating the two deaths. MP Anura Kumara Dissanayake said three years have gone since the government came to power, but it had failed to investigate many political killings took place during the previous regime. “This government was appointed not because of the fame of individual figures such as Maithripala Sirisena or Ranil Wickremesinghe but because of the high demand for democracy and justice. So it is the responsibility of the government to do justice for these victims,” JVP leader Dissanayake said. JVP cadre Nandana Balage was shot dead on April 5, 2009 at Veyangoda while he was participating in JVP propaganda activities for the April 25, 2009 provincial council elections. “The suspects were supporters of the then governor of the Western Province. They prevented the arrest and escaped the law with the help of the powers of the office of the Western Province Governor. Law was not implemented against the culprits who are still at large,” he said. “On January 25, 2010, another JVP cadre, Chandradasa Naiduwawadu, was attacked while he was attending propaganda activities in Ambalangoda during the presidential polls of January 2010. He succumbed to his injuries on February 2, 2010 at hospital. Two others injured in the attack. Though the assault had been a major one and the injuries the victims received were severe, Ambalangoda police did nothing against the attackers who had been supporters of Sajin Vass Gunawardena. A complaint was lodged by Chandradasa Naiduwawadu on January 14, 2010 at the Ambalangoda Police under the number EIB 52/37 on the death threats. That complaint too had not been investigated. There was a case heard at Balapaitiya court on the death and eye witnesses gave their evidence. Thereafter the case did not proceed. These two deaths were among many deaths that took place during the previous government and hitherto among unsolved crimes of a dark age. The crimes had been covered by using the political power. It is the duty of this government to investigate them.” Dissanayake said. Law and Order Minister Ranjith Maddumabandara said that the Department of Attorney General had informed him that there was not enough evidence to proceed legal actions. JVP leader Dissanayake said that there were evidence and accounts of eye witnesses which had been undermined by the then law enforcement authorities because of the political pressure. Finance and Mass Media State Minister Eran Wickramaratne said he informed the Inland Revenue Department to collect the information of wealth and income sources of Parliamentarians. The State Minister was replying to a question by UPFA MP Bandula Gunawardena in Parliament yesterday. He said the IR Department has sent forms to collect information on income of persons who owns vehicles. He said an ordinary person asked him whether the same procedure applies to the MPs and ministers. “This person said there are MPs who acquired new houses, lands and vehicles within a short period after their election to Parliament. He asked me whether the IR Department has sent forms to collect information of those properties as well. I informed the IR Department to find out those information of the MPs. We believe that the law should be equal to everybody,” he said.State Minister Wickramaratne said the government earned Rs. 50 billion by the Super Gain Tax that the Budget 2016 introduced. He said 538 high income earning companies had paid the Super Gain Tax. He said successive governments in the past 30 years had granted unlimited tax concessions and exemptions to the companies through the BOI. These concessions were restricted to a certain level by the new Inland Revenue Act and concessions are now given to the amount of investment made, he said. Finance Minister Mangala Samaraweera said GMOA President Anurudhddha Padeniya is an advocate toiling to bring a new Hitler into power in the country. The Minister referred to Padeniya as Paapadeniya for his actions. The Minister yesterday dressed down GMOA President Anurudhddha Padeniya for intimidating a journalist of the Sunday Observer when the latter has contacted Padeniya over the telephone seeking a comment for a newspaper article. Minister Samaraweera said Padeniya’s behaviour is Taliban or Hitler-like. “Padeniya has told this journalist that they can methodically prove any person to have a mental illness. This was the method followed by Taliban or Hitler rule. The modern world will not allow no room for such manipulation. This revealed that Padeniya is a supporter in the mission to bring a Hitler into power,” he said. About 75,000 women will benefit with the recent government decision to write off the non-consumption loans granted up to Rs. 100,000 by registered microfinance institutions, Finance and Mass Media Minister Mangala Samaraweera said. The Minister was responding to the concerns by JVP Leader and Chief Opposition Whip Anura Kumara Dissanayake in Parliament yesterday. 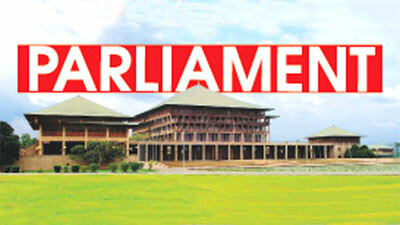 MP Dissanayake pointed out several loopholes in the government’s proposal to provide relief to women who have obtained loans from microfinance companies for a higher interest rate. Minister Samaraweera accepted MP Dissanayake’s fact. “To address that loophole, we will amend the legislation relating to finance companies and microfinance companies prior to Budget 2019,” he said.